Pistol Pete’s Passing from the Homework Basketball 4 DVD instructional series is one of the most in-depth basketball instructional films ever produced on the subject of passing. Maravich’s behind-the-back and no-look passes left defenders standing in their tracks. You can also learn the techniques and drills that Maravich and his father, Press Maravich, took a lifetime developing. Are you a team player? If you want your team to win, you have to play as a team. In order to do that, you must learn how to get the ball to your teammates. Learn how to pass by watching, studying, and practicing these techniques as shown on this video. Your private teacher is Basketball Hall-of-Fame Legend Pistol Pete Maravich! In Pistol Pete’s Passing DVD, you will learn to be a team player and to assist your team on the road to victory. Basketball is not an individual sport, but is a team sport. In Pistol Pete’s Passing DVD from the Homework Basketball series, you will learn to effectively, efficiently, and creatively pass the basketball to your teammates. The objective is to win – to win it takes a team – passing the ball connects the team. Connecting the team leads to winning the game. So, if you want to learn to win, study your homework with Pete Maravich. 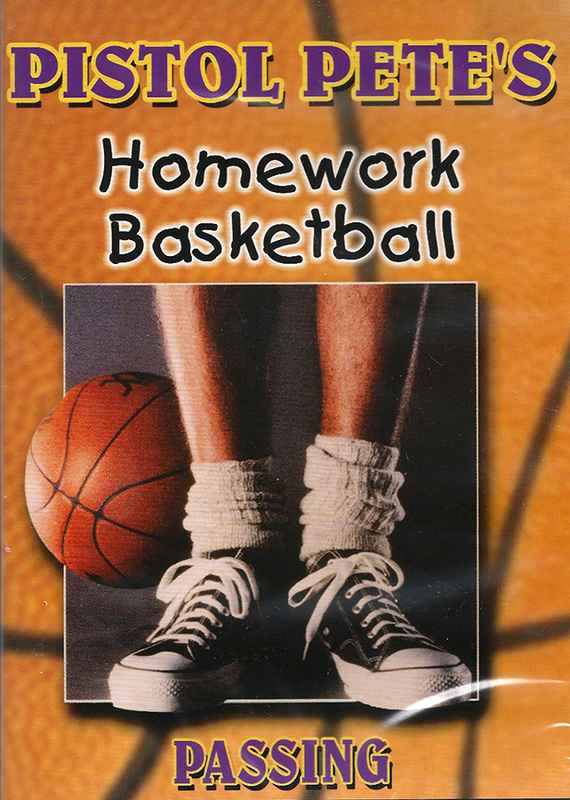 In the Homework Basketball training DVD series, you will learn to mater the fundamentals of all the aspects of basketball. Pictured left is a fundamental dribble called the “stop and pop”. This dribble is used in fast break situations when the defender is coming up behind you during a break away. You come from full speed to a stop while at the same time, you come from a high dribble to a very low dribble. This technique will prevent the defender from stealing the ball from you on a fast break. This is only one of the many drills you will learn as you do your homework with basketball legend Pete Maravich.